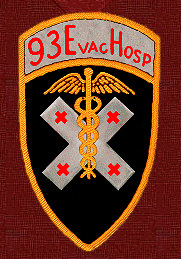 The 93rd Evacuation Hospital - Unit Crest ! 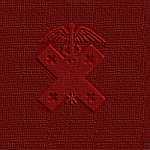 inscribed "FIDE ET FIDUCIA" in silver color metal letters. 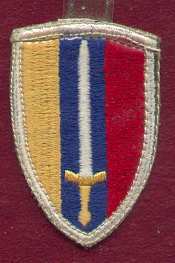 Maroon and white (silver) are the colors of the Army Medical Department. The cross is the symbol of faith; the snakes are the symbol of medicine and plenty. 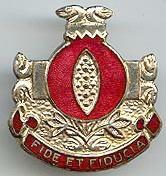 The motto "FIDE ET FIDUCIA" is translated "With Faith and Confidence. The unofficial slogan of the 93rd Evacuation Hospital is "Ready Now". Unit "Pocket Patches" or "Drops"
Your Webmaster still has these "pocket patches", or "drops"! I believe they were designed to be worn when wearing the Class A or Class B uniform. 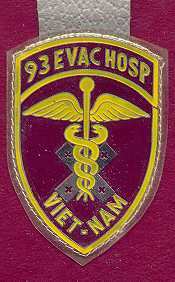 I bought them at our little PX Annex, sometime during my assignment with the 93rd Evacuation Hospital, although I never did get to wear them while I was assigned! Anyone have the 68th Medical Group?